A funny thing happened on the way to the airport. I had a chance to look over the shoulder of Dr Scott Morrison of Rood and Riddle Equine Hospital's Podiatry Clinic, and who would turn that down? The patient was a perfectly healthy yearling colt being prepared for an August sale. But with 30 days left until the sale, the growing colt was showing a slight tendency to be "a bit upright" and some finetuning was in order. Make no mistake: this colt’s hoof conformation wouldn’t be of much, if any, concern other than the fact that he’d be under the microscope at the sale and every detail has to be considered. Every detail, after all, can make the difference in a bidder's enthusiasm for a horse and where the colt would be ranked on a bidder's wish list. In the end, it comes down to dollars and cents but in the climate of recent yearling sales, it could be the difference between a sale and no sale. Dr. Morrison’s solution to this horse’s problem was at once right out of the textbook and equally unorthodox in that it might have come out of two different textbooks. He arrived with two spring shoes, which would be on the menu of recommended shoes for a case like this. But the shoes for this horse were made of two different materials. The solution to working on two front feet with different levels of contraction? shoe also had a hinge in the toe to open the right front more. 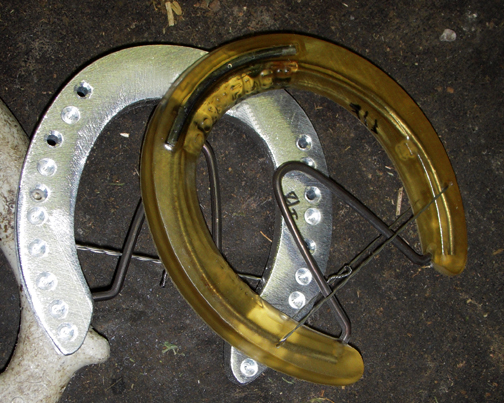 On the left front, which had the least amount of deviation, the horse now wears a Burns Polyflex shoe, into which Rood and Riddle added a spring wire, which is a v-shaped wire roughly the size and shape of the frog. The wire, however, does not touch the frog. Equipak to fill the sole. The spring (frog-shaped wire) does not touch the frog. The Polyflex shoe is made for glueing; it is composed of nearly-transparent polyurethane with a wire spine inside. The shoe was glued on with Equilox hoof adhesive and then the sole was filled with Vettec’s Equipak, a clear cushioning urethane. Before pouring in the liquid padding, Morrison clipped the temporary horizontal keeper wire to release the spring action of the wire. The Polyflex shoe did not have a hinge, but the spring action of the wire and the forgiving material of the shoe would help keep the foot open, Morrison believes. Completed left front foot with polyurethane shoe after Equipak is solidified. Just to clarify: soft urethane-based Equipak fills and cushions the sole and frog; harder PMMA epoxy-type adhesive Equilox glues on the shoe. On the right front, which was slightly more problematic, Rood and Riddle’s shoe fabrication specialist Manuel Cruz created an aluminum hinged shoe with a spring wire. The hinge was in the center of the toe, as typically described for hinge shoes to relieve club feet and contracted heels in more advanced cases. Equilox, the clipping of the horizontal keeper wire, and Equipak again followed. of shoes and devices for the vets and farriers at Rood and Riddle. 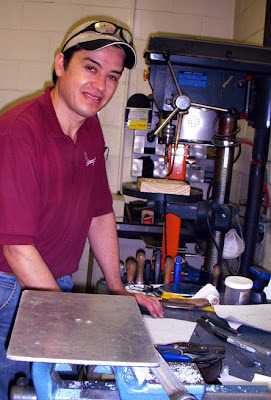 Aluminum hinge shoe fabricated back at Rood and Riddle by Manuel Cruz. hinge in the toe to open the foot. I asked Manuel about the discrepancy in thickness between the two shoes but he said that it was an illusion and that they were almost the same. 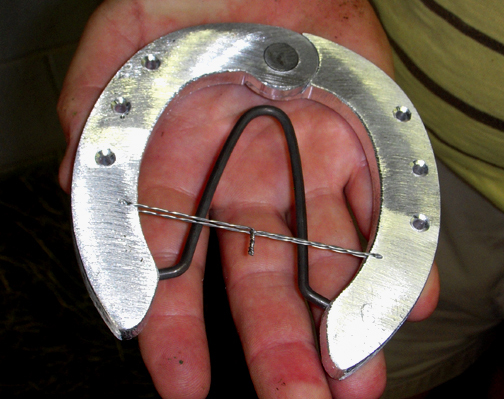 Morrison and McAninch tackled the application of these results-oriented horseshoes to the colt's front feet as if it was routine; with yearling sales season approaching, that may be the case. The organization at the clinic to prepare what's needed for supplies and to fabricate shoess must be impressive when you see how easily the work gets done without searching for things. The case itself was intriguing but equally interesting was the process, especially the speed and efficiency with which Morrison and his technician Loryn McAninch completed the job. I know from my travels that this would have been a half-day job at most clinics but the feet had been traced and trimmed in advance, the shoes fabricated to the tracings, and the adhesive and support materials were ready to go. Another good point about the way this case was handled, from an outside observation, was that the young horse had to stand for a minimal amount of time since the measuring, tracing and trimming had already been done. The unorthodox unmatching spring shoes may have been an insurance policy on this horse's value. We'll never know what his feet might have looked like without this intervention but prospective owners will appreciate the picture-perfect feet that they will see on this horse at the sale. Thanks to Dr Morrison, Loryn, Manuel and the farm staff for allowing me to observe this procedure and photograph it. Good luck to the colt! 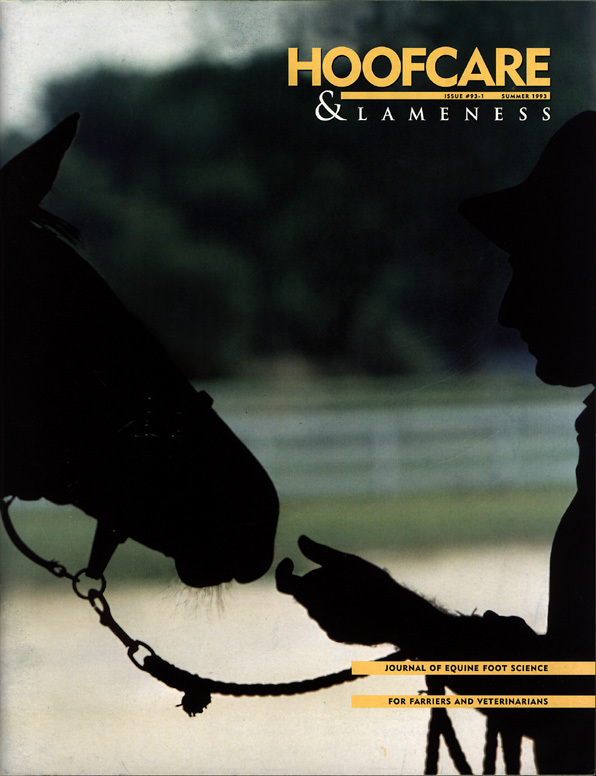 To learn more: A valuable detailed reference paper by Dr. Morrison, Foal Foot Care, is available for download from the Proceedings of the 2009 CanWest Veterinary Conference. All photos © Fran Jurga | Hoofcare Publishing. Wouldn't it be better to look for the reason these feet are not spreading well in the first place? Not enough turnout or too much time in a deep bedded stall or even some heel pain which would cause this colt to land more toe first. Hi Cheryl, well, sure. You can connect the dots and say "let's un-do this dot" (or dots) in the management of this horse. But this horse is in a program that can best be compared to beauty pageants for little girls. Remember Jan Benet Ramsey? A little girl might not need braces on her teeth and contact lenses and a tanning bed but that is what she'll get when it is days before the pageant. She'll look fake, but that's what the pageant judges like. It's the same with Thoroughbred yearlings. Right or wrong, this colt is in an unnatural hothouse-type environment being prepared for the biggest day of his life. Mechanical intervention is doing what nature might or might not be able to do, if the colt was left turned out. You never know but by intervening, they are assuring that the colt will look spectacular on sale day and this relatively mild, short-term intervention might help him avoid a more serious problem. Of course, who knows what will happen to him after the sale and how he will be cared for? The alternative to this would have been an earlier intervention and longer-term shoeing. This way the horse has been able to stay barefoot up until 30 days before the sale. Plenty of other colts in Kentucky have had similar or much more severe correction going on for months, with variable results and applied with variable skill. This farm apparently let the colt's foot develop more or less naturally up to this point, albeit in a controlled environment while he's being prepped for the sale. He'd be better off turned out but he's stuck in a system that wants him to be a plush, rounded beauty object...and then turn around and be a tough, sleek athlete a week later. This is one of the very lucky ones. The yearling sales prep system doesn't make sense, I know. Lots of pigs' ears are being desperately manipulated to look like silk purses. This is not one of them: his problem is minor, his intervention is relatively mild and carefully monitored. I hope he sells to a good home and he gets turned out the next day! Until then, he's like a rare orchid flowering in a greenhouse...an investment that is about to be cashed. Yikes! The third pic...the hoof looks laminitis. 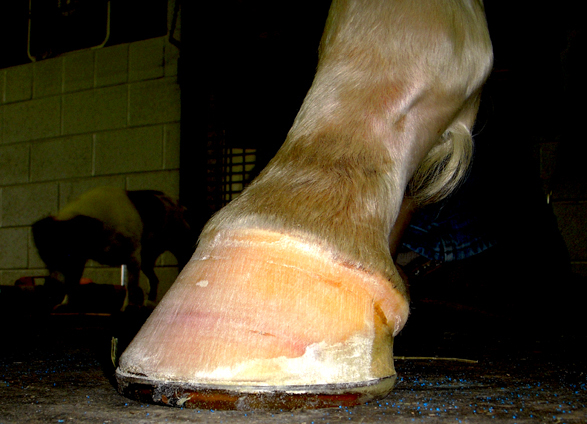 The yellow discolor of the sole indicates inflammation, the bruises of the hoof wall, the coronary band are somewhat starting to seperate and the cracks on the heel gave it away. Looks like the horse had long toe for too long in a natural barefoot setting plus the diet to fat them up isn't helping matters. Unfortunately he won't have decent racing career unless he's one of the freaks that can run on hoof problems. 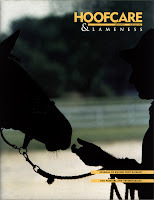 Being able to diagnose laminitis from a single photo taken with my cheap camera is quite an insight! However, I wouldn't read too much into those photos. The yellow tint is exaggerated by the yellow shoe and the head-on flash on my cheap camera. Of course you would know that the wall was sanded and many imperfections show that are not visible in an unsanded hoof, especially in a white foot. If hooves normally were shown after their walls had been sanded, I'm afraid you'd be diagnosing laminitis in most of the hooves in most of my photos of Thoroughbreds with white feet. There aren't that many with white feet, however; this horse is quite flashy that way. Again, the head-on flash is a little harsh, as is the reality of Thoroughbred feet when you look at them close-up. I totally agree about the diet fed to these yearlings to fatten them up. It can show up in their feet and pasterns as much as in the nice round bodies that the buyers insist on seeing. In the future, could you be so kind as to reveal your name and your professional qualifications to diagnose a serious disease from a single photo of a single angle of a single hoof? I probably shouldn't have allowed your post, but I did because I feel that my yeoman-like photos obviously were at fault and I'm sure Dr Morrison would be interested to read your diagnosis of his case. From Helen Stone in FL: I think that by writing an article about such an invasive shoeing you are, in a way, endorsing it. Of course there are those out there who will look at this and say, "Hey, I wonder if this will work on my horse, maybe I should give it a try." They will skip over the part where this is being done solely for the APPEARANCE of the horse, not its HEALTH. I also have to wonder about the folks working at this podiatry clinic- seems that money speaks louder than morals. 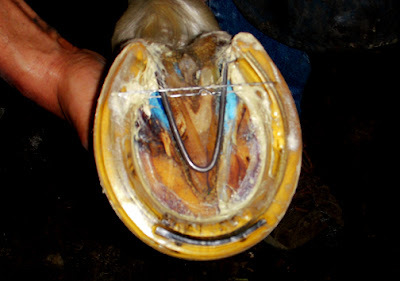 As a hoof care professional myself who happens to specailize in high performance barefoot, there are much better solutions to this yearling's problems than these spring shoes, solutions that would put the horse's well being and longterm soundness first and foremost. I am always amazed at seeing extreme shoeing jobs like this- I can heal and rehabilitate foundered horses without shoes, pads, or even boots, yet professionals like Dr. Morrison feel the need to use devices and mechanics to "fix" problems that are not that severe. Cases like this yearling's make me shake my head...and people wonder why so many of today's thoroughbreds break down at such a young age. Thanks for your comments Fran. It IS a sad state of affairs when horses who are supposed to eventually perform as athletes are maintained in such an unnatrual, artificial way. Then they blame the track surface or any other number of reasons for the breakdowns. They are treated no differently than halter horses or show dogs. You're probably aware of this but maybe your readers aren't about "The Racehorse Experiment." http://www.theracehorseexperiment.com/ Attempting to bring several TB's back to health and condition for racing using non traditional methods. I'm enjoying watching this experiment and hoping for a positive outcome. Thanks again for a very informative blog. Really interesting article. My comment is relating to horseshoes and was wodnering if you could help. Obviously horse shoes have been around for a long time, but have there been any major changes to the design of them over the years? Yes, the design changes have been huge in the last 25 years, especially. The changes are in three areas: 1) materials (iron to steel to an array of alloys, plastics and even wood! ); 2) manufacturing processes that allow three-dimensional sculpting of materials to build in traction or support criteria; 3) perfection of nail-less shoes and boots that allow less constriction of the hoof. It's been quite exciting to see this happen in my lifetime and also to be able to report on it professionally in the Hoofcare & Lameness Journal. Although we are certainly still trying to find the ideal and economical way to protect horses feet for the masses, hoofcare is a very exciting and growing field! Thank you for posting the pics of a yearling that obviously falls into the norm of receiving less than optimum trimming during the most formative time in its life. Please post that horses mature in their 5th yr or later (in the case of draft or warmblood breeds especially) and that includes the coffin bone and the cartilages surrounding it. Encasing a hoof in a shoe prior to reaching maturity (and this can be said of thoroughbreds, quarterhorses, arabs, morgans, etc) predisposes them to issues involving the coffin bone, deep digital flexor tendons and joints north of there. Yes, they are caught in the system. Yes, there should be a better way to allow these babies to mature before they get manipulated into future catastrophic situations (like we saw with Eight Bells...and thousands of others). The hoof was designed to disipate pressure and give the horse a secure footing on the ground. Peripheral loading on the hoof wall alone and no allowance for expansion only drives the pressure of a developing horse's weight inward and upwards. Toe first landings exacerbate the problem and leads to navicular and tendon problems. I agree with your statement to another comment that most of your pics of babies show laminitis. IT IS EPIDEMIC........not the down and out cases that show complete laminae failure, but the slow steady bruising of the hoof wall caused by improper hoof shape and imbalanced infrequent trimming (babies on my book are checked every 3 weeks...no exceptions). White feet are not weaker but they do show everything......so just because they aren't limpin off doesn't mean something isn't going on. The "hothouse" pressure to "look" perfect should not be allowed to continue, for the sake of the horses.